Shanling's new CD-T2000 CD/SACD player shares the stunning aesthetic of the former CD-T1500, but, although superficially similar, the two players are, in fact, quite different. The CD-T2000 is a Red Book CD player constructed around a high-quality Sanyo HD-850 transport. It also features a Burr-Brown PCM 1792 24-bit/192kHz upsampling stage, but no solid-state analogue output. There are actually two 12AUX7 (ECC 82) tubes per-channel (four tubes total), because the player offers the option of single-ended or balanced operation. Like many new CD players, the CD-T2000 features a USB socket, enabling you to use its DAC with computer-based music storage systems. It also has a digital input (and digital output) via RCA phono sockets. Two sets of variable analogue outputs are provided – single-ended via RCA phono sockets and balanced via XLRs. Output voltage levels are claimed to be 2.1V and 4.2V for unbalanced and balanced respectively. The volume control is a digital-type and, having variable output, allows you to connect the CD-T2000 direct to a power amp – though the unbalanced output voltage of 2.1V may be a bit low for some power amps. There are three power transformers: two for the analogue outputs and one for the digital side of things. To retain the smooth classic lines of the earlier player, while offering various switching options, three of the four corner posts feature selector switches: power on/off; output volume and a CD player/USB input switch. The Sanyo transport is a high-quality device that's virtually silent during operation. There are no audible whirrs or clicks – important for an 'open' player like this, as there's no case to reduce the noise. The transport offers fast track access and reasonably speedy fast search – certainly, better than the CDT1500, which was very slow. Shanling's SCD-T2000 (SACD/CD player) had a solid-state output with the option of a tube buffer stage to add a bit of valve warmth. However, this player has a proper tube output stage and no solid-state option. One slight grumble is the way the CD-T2000's volume control automatically defaults to -40dB once power is switched off. While, useful if you're connecting directly to a power amp, it means you have to turn the volume control clockwise about 2.5 turns (or use the remote) to get back to maximum output again each time you switch the player on. Like most Shanling products, the CD-T2000 offers 'battleship' build quality and a very high standard of finish. The entire chassis is made from solid aluminium panels around one centimetre thick and sits on four corner turrets. It weighs in at about 11kg, which is remarkably heavy for a CD player and whether or not its substantial build affects performance is debatable. But the sound certainly has a 'solid' quality to match the look and feel of the player. While the chassis dimensions are more or less the same as earlier Shanling players, having the feet at each corner has effectively made the player wider. Indeed, so wide, it only just fits onto a 'normal' 46cm-width hi-fi equipment shelf. Ideally, you need one with a width of about 50cm. If this product were manufactured in the USA, it would probably cost three or four times what Shanling is asking here and at just under £2,000, makes it a veritable bargain. You can buy it secure in the knowledge that few products anywhere at any price will match it for build quality and finish. 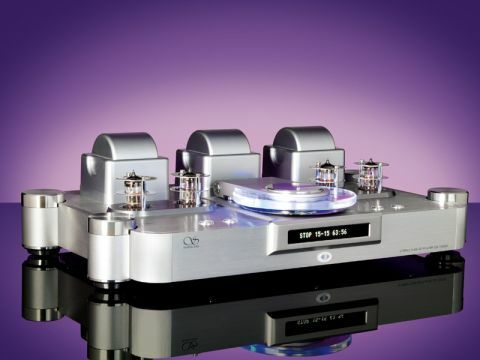 Before auditioning the CD-T2000, we'd been enjoying the sound of the SCD-T2000 SACD player. When playing SACDs, the latter delivers a very open, detailed sound that's very natural and the difference between CD and SACD on this player has been fairly marked (but that's what you'd expect given the technical advantages of a higher-resolution format like SACD). With CD, however, the CD-T2000 sounds better than the SCD-T2000 and while the latter delivers a very open sound – it lacks that slightly hard 'closed-in' tonal balance you almost always get with CD. This difference is very noticeable on instruments like cymbals. Via the CD-T2000, cymbals reproduce with a lovely breathy openness that sounds like good analogue. Transients have crisp attack and there's plenty of body and shimmer. But what's unusual and remarkable is the lack of tonal hardness – something that really lets you experience the sound of stick on metal – or metal to metal when orchestral cymbals are crashed together. Playing the recent Boulez recording of Mahler's orchestral song cycle Des Knaben Wunderhorn, we were forcibly struck by the truthful natural quality of the sound – the pure uncoloured timbres and spacious naturalness produced. Had we not known otherwise, we'd have thought we were listening to an SACD rather than a CD – there was a comparable purity and 'rightness' about the sound. With no pressing copy deadline, we spent many hundreds of hours listening to the CD-T2000 on all kinds of music recorded over a vast period of time and always the sound had a pure, open naturalness that seemed like an open window on the music. If the aim of high-fidelity is to reproduce the original without adding or subtracting, then the CD-T2000 gets pretty close to that ideal. It's a player that satisfies your needs without leaving you hungry for more. This is an unusually good player – one that sounds as good as it looks. It delivers a smooth, natural, well-balanced sound that lets you hear the music as it was originally recorded. Considering our enthusiasm for the SACD player, the prospect of a player that could make CDs sound almost as good as SACDs might still prove too much to resist. And anyway, the thought of going back to something 'inferior' once the review period was over was just too depressing to contemplate. Hearty recommendation, as I think you'd agree.